Illustrator is not only an industry standard for creating vector graphics, it’s also really good fun to use. This guide is intended mainly for people who are new to using Illustrator, but even if you’ve been using the program for a while you might find this a useful refresher course. We won’t get bogged down too much with theory but there are some concepts you’ll need to get your head around when you are drawing in Illustrator. Illustrator creates vector-based artwork. This means it can be resized without distortion. If you want to design a logo that can be made small enough to fit on a baseball cap AND enlarged enough to fill a billboard, vectors are the way to go. When you’re drawing in Illustrator, you create a line called a path. A path is made up of one or more straight or curved segments. The beginning and end of each segment are marked by anchor points. A path can be closed (for example, a circle), or open, with distinct endpoints (for example, a wavy line). Let’s get started with Illustrator’s line tools. It’s important to understand that when you draw a path with these tools, the colour of the line will be the colour you have chosen for the stroke, the path itself is a non-printing element. The Line Segment tool is the top tool in the toolbox that includes the Arc tool, the Spiral tool, and Grid tools. To see all of the hidden line tools, just click and hold the pointer over the Line Segment tool. 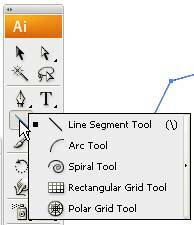 You’ll see the Arc tool, Spiral tool and Grid tools. In Illustrator, you can “tear-off” a set of tools so that they form their own floating palette. Just click on the small triangle on the right hand side of the hidden tool fly out. Position the pointer where you want the line to begin, and click and drag to where you want the line to end. Click on the artboard where you want the line to begin. A dialog box opens, and you can specify the length and angle of the line. If you want to fill the line with the current fill colour, select Fill Line. Then click OK. The line will be drawn as specified. 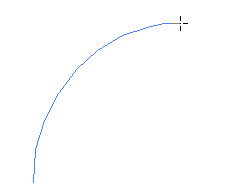 When drawing a freehand line segment, you can constrain an angle to an increment of 45 degrees by holding down the Shift key as you draw the line segment. 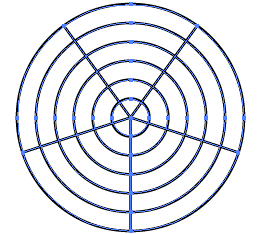 To draw a line segment symmetrically around a central radius, hold down the Option (Mac) or Alt (Windows) key. 1. 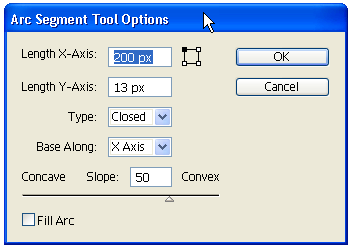 Select the Arc tool . 2. Position the pointer where you want the arc to begin, and click and drag to where you want the arc to end. Hold down the Shift key to constrain the arc to increments of 45 degrees. 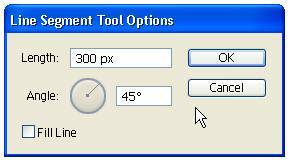 Hold down the Option (Mac) or Alt (Windows) key as you draw to create an arc using the initial click point as a center point. 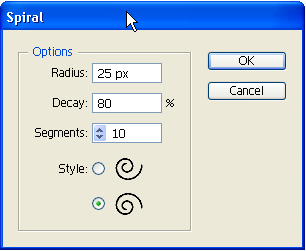 You can also use the Arc tool dialog box to set up more sophisticated curves. 2. Click once on the artboard where you want the arc to begin. In the dialog box, click a square on the reference point locator to specify from which corner point the arc will be drawn. There are quite a few options to choose from here and my suggestion is to try them all so that you can get a feel for how they affect the curve. Click OK.
Specifies the width of the arc. Specifies the height of the arc. Specifies whether you want the object to be an open path or a closed path. Specifies the direction of the arc. Choose X Axis or Y Axis depending on whether you want to draw the base of the arc along the horizontal (x) axis or vertical (y) axis. Specifies the direction of the arc’s slope. Enter a negative value for a concave (inward) slope. Enter a positive value for a convex (outward) slope. A slope of 0 creates a straight line. Fills the arc with the current fill colour. 1. Select the Spiral tool from the toolbox. Click once on the artboard where you want the spiral to begin. In the dialog box, you can set any of the following options, and click OK.
Specifies the distance from the center to the outermost point in the spiral. Specifies the amount by which each wind of the spiral should decrease relative to the previous wind. Specifies how many segments the spiral has. 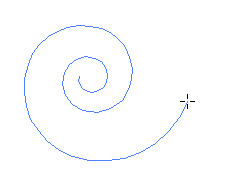 Each full wind of the spiral consists of four segments. Specifies the direction of the spiral. You might like to use the rectangular grid either for layout of data or even as part of layered design. 1. Select the Rectangular Grid tool . Click and drag on the artboard until the grid is the size you want. 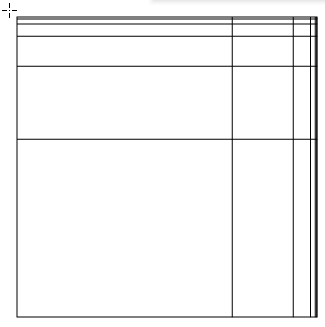 Click once on the artboard open the rectangular grid dialog box. In the dialog box, click a square on the reference point locator to specify the point from which the grid is drawn. Then set any of the following options, and click OK. The options I’ve chosen below, create the rectangular grid you can see underneath. Specifies the width and height of the entire grid. Specifies the number of horizontal dividers you want to appear between the top and bottom of the grid. The Skew value determines how the horizontal dividers are weighted toward the top or bottom of the grid. Specifies the number of dividers you want to appear between the left and right sides of the grid. The Skew value determines how the vertical dividers are weighted to the left or right side. Replaces the top, bottom, left, and right segments with a separate rectangular object. Fills the grid with the current fill color (otherwise, the fill is set to none). 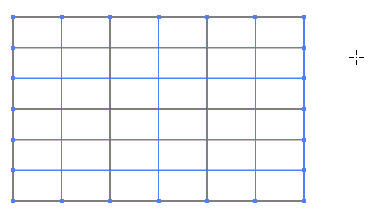 1.Select the Polar Grid tool . Click and Drag until the grid is size you want. To open the dialog box for the tool, click once on the artboard. 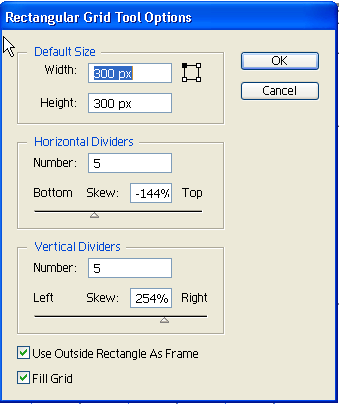 In the dialog box, click a square on the reference point locator to specify from which corner point the grid is drawn. Then set any of the following options, and click OK.
Specifies the number of circular concentric dividers you want to appear in the grid. The Skew value determines how the concentric dividers are weighted toward the inside or outside of the grid. Specifies the number of radial dividers you want to appear between the center and the circumference of the grid. The Skew value determines how the radial dividers are weighted counterclockwise or clockwise on the grid. 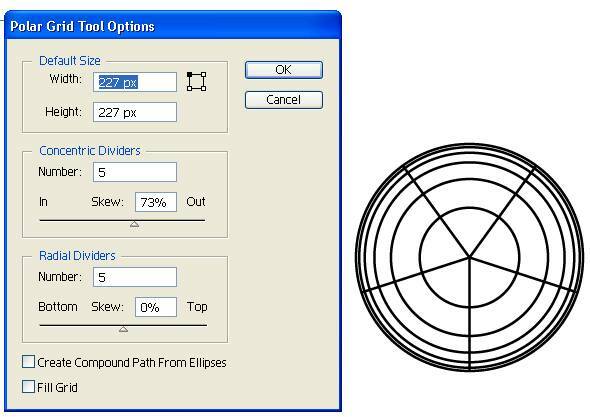 Converts the concentric circles into separate compound paths and fill every other circle. Ok, so those are the line tools. They’re all easy to use but I would recommend that as well as practicing drawing freehand with each one, that you also try out the dialog boxes for each so that you can see how precise you can be with these tools. Tomorrow we’ll take a look at the Shape tools and later in the week the Pen tool.